Brad Balliett, described as 'impressive' by the New Yorker, loves life as a musical omnivore, focusing equal parts of his diverse career on composing, playing bassoon, and teaching artistry. Brad frequently performs with the Saint Paul Chamber Orchestra, and has performed with the Chamber Music Society of Lincoln Center, Orpheus Chamber Orchestra, Metropolitan Opera, Houston Symphony, New York City Ballet, and the International Contemporary Ensemble, and at the Marlboro, Tanglewood, Stellenbosch, Newport Jazz, and Lucerne Festivals. 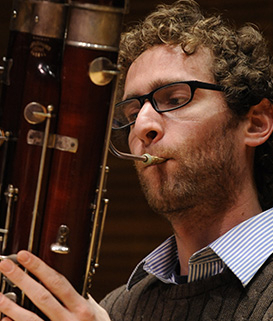 He is principal bassoon of the Princeton Symphony, and is a member of Signal, Metropolis Ensemble, and Deviant Septet. He has performed as a soloist with the Houston Symphony and Johannesburg Symphony Orchestras. As a composer, Brad has witnessed and participated in a steady stream of premieres of his orchestral, chamber, choral, opera, and incidental music. Recent commissions have come from Carnegie Hall, Cecelia Chorus, Metropolis Ensemble, and the Boston Youth Symphony Orchestra Wind Ensemble. The City of Tomorrow is a sponsored project of Fractured Atlas, a non-profit arts service organization. Contributions for the purposes of The City of Tomorrow must be made payable to Fractured Atlas and are tax-deductible to the extent permitted by law.